Discussion in 'Bulletin Board' started by AthersleyRed, Nov 7, 2018. Gravy Chips, sadbrewer, judith charmers and 8 others like this. All that loss of life was unbelievably tragic but to almost get right through it only to fall in the last days is so sad. John Peachy, Artie Fufkin and Redblueunwhite like this. Thought about this earlier today. Must admit it brought a lump to my throat. RIP to a very brave man and true Reds legend. Gunner Wilfred Bartrop Worksop Guardian 6 December 1918 A few days before the suspending of hostilities, another Worksop soldier, Gunner Wilfred Bartrop, R.F.A., attached to a Trench Mortar Battery, was killed in action. 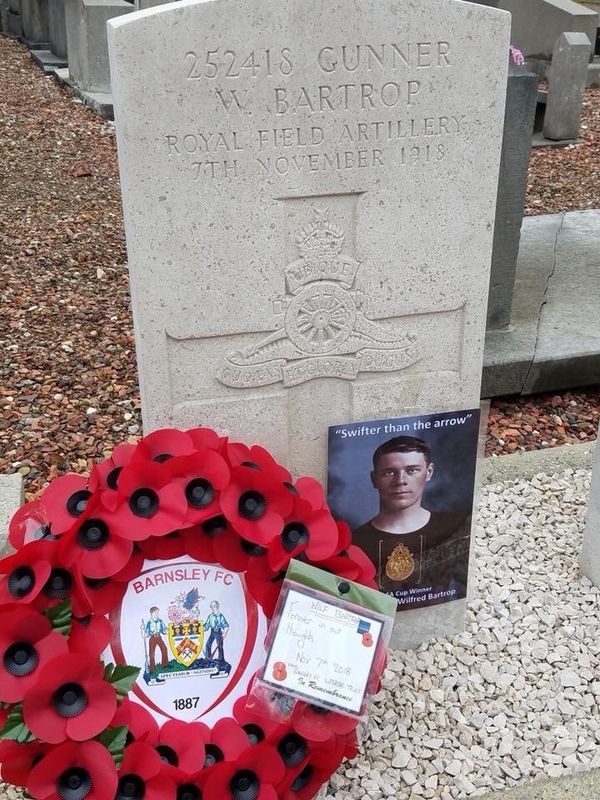 Gunner Bartrop who was 29 years of age, was exceedingly well known in Worksop and Barnsley as a clever and most capable footballer. He was a well built young man and was well liked by his associates and all who knew him. He joined up on Jan 20th this year and had been in France since June 13th. Previous to enlisting he worked at Manton Colliery. A report that he had been killed was received some time ago, but it was only recently that his wife, Mrs Bartrop, who resides in Clinton Street, received the official intimation. She had also received a letter from her husband’s late commanding officer, Capt J E Beningfield, who says:- I sincerely regret to have to inform you that your husband, who served in my battery, was killed on 7th th November. He was proceeding up the line with a gun and a shell burst quite close to him, the splinters hitting him in the thigh and breast. I was not on the spot at the time, but one of my men who was, informs me that he only said, I am hit in the leg and the next was, he was dead. I am having a cross put on his grave. Please accept my deepest sympathy in your great loss. Gunner Bartrop was a sterling fellow and did very good work with me.“ Great sympathy is expressed with Mrs Bartrop in the trouble that has come upon her. Two of her brothers, Driver F Millership and Pte B Millership are serving in R.A.M.C. and an uncle, Pte Charles Walker, is in the Durham Light Infantry. A brother-in-law, Pte Percy Bartrop, has been wounded and is now at home, and another brother-in-law, Corpl Mitchell has seen service in Salonica. Wilfred Bartrop joined the Worksop club as a totally unknown player in 1908 about the time of the famous excursion to Chelsea. He was originally tried with the first team as centre forward, but later found his true position as outside right with such success that at the end of the following season, (April 1909), he was one of the two players selected from the Worksop club to represent the Midland League against the champions at Lincoln. Barnsley then secured his transfer and he immediately secured a place in their league eleven, soon to become famous as one of the greatest cup fighting combinations of recent years. In his first season, Bartrop assisted the Barnsley team to gain a place in the English cup final, where they were somewhat unluckily beaten by Newcastle United. Two years later however, the South Yorkshire club achieved its ambition, and secured the coveted trophy after a sensational series of struggles in which they met Bradford City four times, Swindon twice, and West Bromwich Albion twice before finally emerging triumphant. Bartrop, thereby, became the only Worksop born player the right to wear an English cup winners medal. Subsequently, he was transferred to Liverpool, and on the suspension of serious football, he returned to Worksop, and secured employment at Manton Colliery. Before enlisting, he occasionally assisted Worksop and Manton Colliery, but did not take a prominent part in football. Big, strong and speedy, Bartrop was a fine player in his day, his best characteristic being the wonderful accuracy of his centres, from which the Barnsley inside forwards reaped a big harvest of goals. BarTyke, benjamoose, sadbrewer and 9 others like this. Been in the Town Hall to look at the ww1 exhibit. Wilf Bartrop's story is there with a few exhibits including his 1912 cup winners medal. There's a book available about his life which was also featured. grandfathertyke, Gravy Chips, BarTyke and 10 others like this. Fantastic gesture. Well done all concerned. Wonderful gesture on behalf of Barnsley Football Club and town. Lovely tribute. The headstone looks very new, as does the gravel at the foot of it. Anyone know if the club, or past owners may have been involved? Think it’s a national thing there’s a war graves commission of some kind that officially looks after them all over the world .